My investigation of the beliefs of the JWs had some eerie similarities to my initial investigation of Mormonism, especially on this topic. I found "the" major JW apologetic source -- Greg Stafford's Jehovah's Witnesses Defended -- using, misusing, and misunderstanding some of the same sources as their Mormon counterparts, albeit in different ways. Finally, I found (as I expected, unlike the Mormons) that the JWs don't put up as much of a fight on the apologetic front. Therefore, the reader may find this essay surprisingly brief. 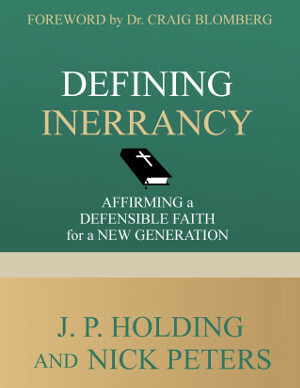 I found Stafford an ironic read in ways because although he has some hints about Wisdom, he doesn't see the connection and how it refutes his view of Jesus -- most likely because he has no view at all into the intertestamental literature that founded the "crucial conceptual category" that the NT writers put Jesus into. In this light, I found much of Stafford's material quite irrelevant. The question, "Is Jesus Jehovah?" doesn't require a yes or no answer from our side. Wisdom covers this -- Jesus may have been going around as "Jehovah" (Yahweh) at times in the OT, using that name in his pre-incarnate dealings, but Proverbs 8, as we show in the linked essay, would suggest that there isn't a one-to-one correspondence. How may JW belief about Jesus be represented? It is clear that the JWs match with the ancient Arian position of Christ as a "created being" -- differing from Mormons mainly on the point that Jesus was not in some sense eternal. Jesus was created before the universe, the JWs say, but was not eternal. The JWs rightly recognize Jesus' functional subordination to the Father; but for some reason don't understand that Trinitarianism recognizes it as well. [Stafford, 89]. As JW writer Edgar Foster incorrectly states, "Trinitarianism does not allow room for subordination amongst the eternal, necessary, and immutable relations of the Trinity...Subordinationism and Trinitarianism cannot exist side by side." Trinitarianism has always allowed for functional subordination in the Trinity. But JWs deny Jesus' ontological equality with the Father; he is, the JWs say, a completely separate being from the Father -- the Trinity is a construct of Greek philosophy. Yes, that's what the Mormons say as well, though they come to a different conclusion ultimately about the solution. This in spite of the fact that their own view, essentially Arianism, was far more dependent on Greek philosophical categories which had problems ascribing divinity to anything material. Anyone who knows the JWs knows what the issue here is. They want to put an article in the text: "the Word was a God." Well, if you are expecting me to analyze the Greek here, and produce arguments against the a, I'll have to disappoint you -- not because I think the JWs are right, but because it makes no difference if they are. Why? First, because it is clear, as we have shown in the linked article, that John's prologue is deeply influenced by the "Wisdom connection". Even if John calls the Word "a god," it is clear from his connection to the Wisdom tradition what he thinks the relation of this "second god" to the first God involves -- something that matches the Trinitarian view, not the JW view. Calling Christ "a god" does not carry with it the freight, "an ontologically separate being." Proof of this? There's more. Second -- readers who see my allusion may know what I will say next. We already know that the Jewish historian Philo's vision of the Logos was the same as the Christian idea of Jesus, in terms of the Logos' relation to God the Father. Yet Philo does indeed call the Logos a "second God". If Philo can do this and yet maintain the two entities as ontologically related, in the same sense that we believe Jesus and the Father to be related, then even if the JWs are correct about the reading, "the Word was a god", this says nothing against an ontological relationship in a Trinitarian sense. A good look at Bauckham's God Crucified, and a better understanding of the work of Hurtado (which he has, but doesn't understand - 198) would have helped Stafford greatly here, along with knowledge of interestamental literature. But to put it another way: Even if the JWs win the battle over including "a" in John 1:1, they still lose the war over the nature of Jesus, both because of the Wisdom context of John's prologue and because the phrasing "a god" would still accommodate, in light of Philo, a Trinitarian conception of the Godhead. Interestingly Stafford also makes the same assumption that Mormons do in regards to the use of Elohim as a word in the OT . More recently I have been referred to a site by a JW named "Heinz" who is conversant in the Wisdom literature -- but regards it as "damaging to Trinitarians" because it shows that "Wisdom was created!" Sirach 24:9 is quoted as, "He created me from the beginning, before the world, and I shall never cease." But 42:18-21 is not quoted, and that is what makes it clear that while Wisdom (and therefore Jesus) is indeed a "creation" (as Philo says, an effulgence, as light emits from a light bulb) of God, Wisdom is an eternal creation of God and can therefore be spoken of as "created before all things" without any implication that there was a point or time when it did not exist. Gen. 4:1 And Adam knew Eve his wife; and she conceived, and bare Cain, and said, I have gotten a man from the LORD. All of these should provide substantial object lessons that merely quoting English versions is a hazardous exercise. Prov. 4:5 Get wisdom, get understanding: forget it not; neither decline from the words of my mouth. Clearly "wisdom" is not something we create or acquire from outside; we cultivate our own attributes from within. Yet we also see it, as in Gen. 4:1 and Prov. 8, used of the imagery of giving birth. The nature of Wisdom to God is of an attribute that is possessed, used, and cultivated (in line with God using Wisdom as a tool to create, in Proverbs 8). Add to this the understanding of the ancients of the interlinking of owner and property, and the conclusion comes that qanah carries the meaning of a possession that is an extension of the owner. In this light Prov. 8 says nothing in terms of the means and method where Wisdom was qanahed and cannot be used by JWs to argue that Christ is a being created as humans were rather than eternal. BAGD indicates that we cannot always discern the meaning of apaugasma. Its active sense is "radiance" or "effulgence"; the passive sense is "reflection" (BAGD 82). This reference work goes on to demonstrate that Origen, Gregory of Nyssa, Theodoret and Chrysostom all accepted the active meaning of apaugasma. F.F. Bruce also suggests construing apaugasma as active in Heb 1:3 as does A.T. Robertson (Bruce 5; Robertson 557). Harold Attridge offers a perspicuous observation regarding this issue, when he informs us that "the context of Hebrews itself, where apaugasma is paralleled with 'imprint' (character), may support a passive understanding of apaugasma, although that second term [character] is not entirely free from ambiguity" (Attridge 43). In the final analysis, after discussing Philo and the deuterocanonical book of Wisdom, Attridge has to admit that the meaning of apaugasma is not easy to pin down. He seems to think, however, that the passive sense is more preferable in Heb 1:3 than the active sense. While the precise meaning of apaugasma and even character may be somewhat ambiguous, the overall thrust of the words in the text are clear enough. Patristic and modern commentators prefer the active sense, whereas the passive sense is offered by other moderns. Heb. 1:3 derives "from a specific source in the Wisdom tradition," Wisdom of Solomon 7:26. This document uses both emanationist language and the passive language to describe Wisdom. Philo's use of the term is clearly "active" when he refers to the human mind but "passive" when he refers to the world. The determinant is context, and given the parallel with Wisdom as an attribute of God, the active sense is clearly warranted in Heb. 1:3. Attridge notes that the parallelism in Heb. 1:3 "may not be synonymous, but antithetical, as in the two preceding clauses," which is against the JW view. Attridge nevertheless agrees with our view that the text depicts a "pre-existent Son" and actually makes no admission about the meaning being "not easy to pin down." We would finally note that the "imprint" language fits in with the use of eikon indicating that Wisdom is God's ordained representative on earth. Thus both active and passive meanings for apaugasma would be appropriate. 4) objective (relates to the action of the "firstborn" upon the creation). Helyer notes that option 1) is excluded by virtue of a) the hoti clause of v. 16 and the pro panta of v. 17, which clearly exclude Christ from the realm of created things; b) the language of eikon in v. 15 and pleroma in v. 19, which includes Christ in the full deity; c) the parallels to the Wisdom tradition, in which Wisdom is not a creation as the rest of creation, but is eternally begotten; d) that the partitive would emphasize the -tokos aspect of prototokos (firstborn), something paralleled in the NT only in Luke 2:7. Helyer therefore opts for the objective genitive as the intent of the passage. Though some regard this genitive to be partitive (thus, Firstborn who is a part of creation), both due to the lexical field of “Firstborn” including “preeminent over” (and not just a literal chronological birth order) and the following causal clause (“for [hOTI] in him all things were created”) - which makes little sense if mere chronological order is in view, it is far more likely that this expresses subordination. Further, although more examples of subordination involve a verbal head noun, not all do (notice 2 Cor 4:4 above, as well As acts 13:17). The resultant meaning seems to be an early confession of Christ's lordship and hence, implicitly, his deity” (Wallace, Greek Grammar Beyond the Basics, p. 104). Readers recently asked us to look at a JW item titled, "Jesus Christ- Wisdom Personified" on a JW site titled "Scriptural Truths". The piece does not name an author, so we will simply refer to the author by the name "Robin." Even though passages like 1 Cor. 1:24 explicitly say that Christ IS the Wisdom of God, it is declared that "obviously" Paul "is not stating that Christ is the attributes, but that these things are personified in him." How and why this is "obviously" so is not explained; and indeed, Robin goes on to quote several patristic writers, as well as J. Vernon Magee, as making the direct equation he refuses: "Wisdom is Jesus." Not, "Jesus personifies Wisdom" but he IS Wisdom. So likewise Robin asserts that Jesus is not the Word, as John 1:1 states, but is a personification. The only argument as such that Robin presents for this purpose is to cite such as Proverbs 2:10, referring to wisdom entering the heart, of which he says, "we see no need to apply it to Christ, for it is simply speaking of the attribute." But that is a miscue on several points. First, Proverbs does not see human wisdom as an "attribute" but as something acquired or possessed. The correspoinding "attribute" is not "wisdom" but "having wisdom". Second, no one argues that each and every reference to "wisdom" in the Bible is to be identified with Christ; only those which refer to God's Wisdom. Robin goes on to admit that Jesus "fulfilled" several aspects of Proverbs 8, but this is amerable to a view that either makes a direct Jesus = Wisdom equation, or "Jesus personifies Wisdom", so we skip to where we do have some disagreement. Robin cites Col. 1:16, agreeing as we would that it refers to Jesus, but clearly unaware of the parallels in the Colossian hymn to apocryphal literature which makes the direct equation far more likely. Within verse 22 we find several translations to be provided. Some render it “made”, some “produced”, some “created”, and others “possessed. Which is accurate? In reality, all of them are. Within the Hebrew text we find the word QANAH, which generally is related to acquisition and thus possession. Within the Greek Septuagint we find the word EKTISEN, which means created. Some have taken the position that Wisdom was “possessed” by God, not created, and that this was done from eternity. They, however, confuse the attribute itself with the personification. The first point we note is that QANAH, as already highlighted, always includes the idea of something that was acquired. The idea of an eternal possession is not found within the use of the term. This is evident from the following verses: Gen. 14:19, 22; 25:10; 39:1; 50:13; Prov. 17:16, etc. The use of QANAH in the Hebrew scriptures is very clear, and any example of it can be checked to see this. Genesis 6:4 The giants were in the earth in those days, and even afterwards when the sons of God came in to the daughters of men, and they bore to them; they were heroes which existed from ancient time, the men of name. These men existed me’olam and yet we would not argue that they existed eternally, would we? The LXX agrees, with both Proverbs 8:23 and Genesis 6:4 using the Greek noun AIWN. Certainly not! In light of the birth imagery used in Proverbs 8, no reasonable person can possibly find the expression to denote his existence to be eternal. Why? Because to claim such would be nothing short of special pleading, with every other use of the term to denote something coming to be that did not exist prior. This is a well established logical fallacy that these ones are forced into in order to maintain a broken theology. It is clear from this commentary that someone needs to read Barr's work Biblical Words for Time. The word 'olam means in pertpetuity; there was no Hebrew word for "eternity" and so the piling on of superlatives (which Robin has no comment upon) as in 8:23 was the only way to express eternality in the Hebrew language, by magnifying Wisdom's immense age (and this is confirmed by the point that it is indeed used of YHWH, yet Robin cannot bring himself to conclude therefore that YHWH was not eternal). At the same time, that the title "Wisdom" was used implies something YHWH possessed at all times YHWH existed; and not even a JW regards YHWH as a non-eternal being. Thus Robin is caught between a rock and a hard place: Either he must argue that YHWH did not eternally possess His own Wisdom; or else he must admit that Wisdom, as a hypostatic production of YHWH, was and is eternal, as indeed concluded intertestamental Jewish texts which the NT writers made use of in their descriptions of Christ as Wisdom.